WINNER saw a ghost in their recording studio? WINNER's Kang Seung Yoon shared a story of how the team thought they saw a ghost recently. 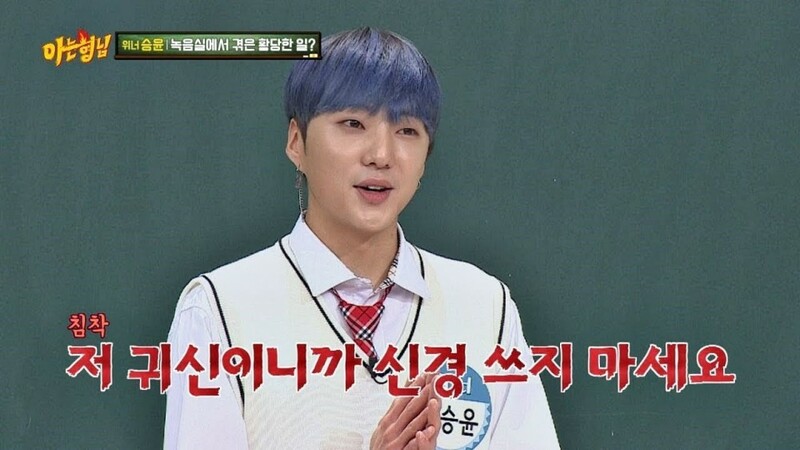 On the May 12 installment of 'Knowing Brothers', WINNER made a guest appearance and during the Q&A segment, Kang Seung Yoon revealed that he and the rest of the members thought they saw a ghost. "While we were recording our album, this one lady was just sitting down on one side of the studio (for 2 hours) as if she was supposed to be there. So we thought she was a new staff member but it seemed that no one else knew who she was either and so I asked who she was. She answered, 'I'm just a ghost, don't worry about me,'" Kang Seung Yoon started. He continued, "Even at that moment, I really thought she was a ghost and only I could see her. But as soon as she answered, the rest of the members shuddered as well and freaked out. It turns out, she wasn't a ghost, but instead, she was a non-celebrity (a fan) who had snuck in. She was eventually escorted out of the building but what was scary was that when this was all happening, her facial expression didn't change once." Did you catch WINNER on 'Knowing Brothers' this week?